in Creative & Tech with tags Google Assistant, Google Home, mental health, national geographic, Veterans, voice technology Both comments and trackbacks are closed. Ahead of Veteran’s Day this year, we worked with National Geographic to release Bravo Tango Brain Training, the first-ever voice app that democratizes veteran access to mental health care. Deploying meditation-based treatment methods commonly used by military professionals, the app is meant to enhance mental health support for America’s veteran community. 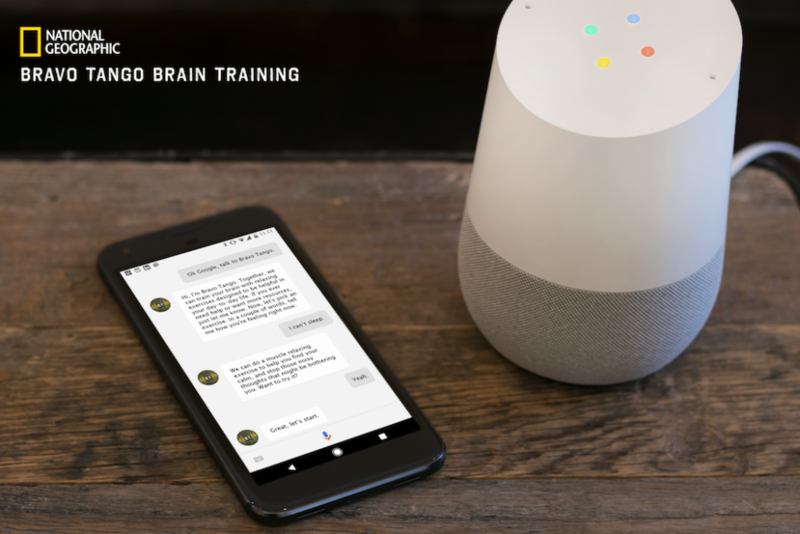 The Bravo Tango Brain Training app is now available across all Google Assistant powered devices. In producing their scripted series, The Long Road Home, based on Martha Raddatz’s book that chronicles the lives of service members and their families through deployment and post-deployment, National Geographic gained deep insights into the home life of veterans, ultimately realizing there was an opportunity to expand the impact of their stories. Inspired by the real-life veterans portrayed in the series, we wanted to go a step further and do something to not only enhance mental health support for veterans and reduce barriers to seeking treatment but also bring renewed attention to important veterans’ issues. Read more about the project in Huffington Post and USA Today.